Urban Affair: Can we reuse existing habour structures for anything interesting? Cities are growing, and will continue to grow. This blog will be staging simple questions about the development of our life in the city, and putting them into a wider perspective. Can the seemingly insignificant and everyday-like take part in this discussion? Does it have a role to play? Can we reuse existing habour structures for anything interesting? Can we reuse some of the existing habour structures by reinterpreting and remodelling their use to suit a modern-city life? By thinking about the city fabric as spaces of certian qualities, some of these with eternal and unique values, we can start to discuss new and other usees of i.e. the Daniels slippur and the Alliance building. By transforming these spaces and constructions into more suitable functions for modernday city life, we have the oportunity to create new public spaces. When reusing history and introducing the sitespecific nessity considering climate, the developing of the Reykjavik city identity is at the same time being remodelled and tied to its roots. These initiatives doesn't have to big plans or vast developments, but can in a small scale start to introduce new functions in the existing habour, attracting more people and transforming it into a functional lively cityarea full of identity, over time. Any ideas? Please comment! Endilega Skrifið! elin - she of the very long comment on the second to last post. Absolutely, these builings can, and should, be re-used, recycled if you will. Not by being precious about their unique qualities, but by incorporating them into modern daily life. As perhaps a covered market place, placed in a center for sustainability, ecology and reinvention, center for "green thinking", ecological think tank or something like that. Yes! and this is already happening to some extend; The Guerilla shop, the Sjögreffin etc. But this way of thinking and working must be incoporated into the bigger plan. It is about re-using parts and building upon an existing fabric. - Not starting from scratch. Not so much because of outstanding value of certain buildins, but because of the quality which makes them suitable for different kind of use. I have also wondered why there is so few places to shop for 'fruits&vegs' or fish (for that sake) here in Reykjavik. In Copenhagen a large covered 'fruit&vegd' marked has been under it's way for a long time in a central location. Hopefully, once realised it will show the oportunities raised by creating public functions, 'attractors', on expencive landplots. I think this could be a way to develop Myrargatan too, and as you say combining it with a 'green thinking' strategy. And what about Slippurin? Isn't it also possible to re-use the space, to give it a new meaning? By incorporate structures into the slope, having the most spectacular view over the habour and towards Esjan? Personally, I'd like to keep the Slippur, because I find watching the work being done fascinating. Seeing the ships out of their element, the underside, the paint jobs. But was supposed to stop years ago so I assume it will. Like I mentioned in my first comment on the other post, I think there are two things that are sure to stop the natural momentum in the area. 1. If the tunnel is built under Mýrargata. 2. if the exsisting buildings are torn down and replaced. I agree, there is no intrinsic value in the existing buildings, they are not by any means special as such. Sægreifinn, Hamborgarabúllan and the other great stalls and stores have developed and spawned at a very organic pace and by reusing space in a way that is common in other countries, but not so much in Iceland. Here, we have a tendency to let buildings fall into disrepair, after which everyone agrees that they are an eye sore and must be torn down for a bigger, better building. And as I write this, I'd like to point out that I'm not at all someone who romanticizes everything old or "oldfashioned". There are so many amazingly beautiful buildings from the fifties and sixties that are simply not well kept. The beauty of the buildings in the harbor lies in their usefulness. That they have a soul of hard work and a connection to the sea. Hm, I realize I just wrote pretty much the same that you did. I think we have to start looking at what we stand for, where we come from. Othervise the area is going to be an unoriginal and uninteresting space. We want art museum, concert halls, design centers, bars and restaurants. That is all fine but where is the real life, people working, people studying ect. tunnell. A FISH, frut&veg market is also a brilliant idea in connection with the harbor. I’m convinced that reusing some of the existing harbour structures could result in an interesting, character-full and affordable future! Despite the Northwind. Tourists are very fond of the area today, lets keep them interested! As Elín says, there are many places around the world to look for inspiration. And how about using an old ship for something, f.x. a restaurant? Stubnitz is an old German trolley ship, today a party boat! I agree that the potential of Myrargata area is being overlooked if everything is to be erased at once. 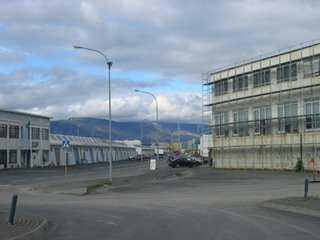 Apart from the history (the beginning of Reykjavik as a "togarabær") the view over Esjan in course with the many colours and forms of the industrial era, that whole experience is something special. Tanja and Elín, you mention the development that has been going on in the area. The are many small businesses and companies that have decided to make use of the environment as it is now at the same time as architects and city planners have been busy drawing. You mention shops and services (Sægreifinn, Guerilla Store, Hamborgarabúllan, Rauðhetta og Úlfurinn). But you will also find studios and offices, f.x. filmmakers (in Slippfélgshúsið), computer games (in Víkin) and others. If you ask these people they will tell you that they find the environment and the proximity of the harbour industry (seeing boats being pulled up and painted etc.) stimulating. Rakel, if you want Myrargata in a tunnel you must pay for the tunnel. The argumentation for putting up as many apartment blocks as possible (but that is the plan now) is to pay for the tunnel! But do we really need the tunnel? Maybe we can use the water everywhere around, where is Akraborgin?! 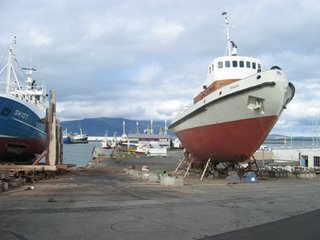 Concerning having fishing boats still around, I’m not sure if that is the reality anymore. The harbour has already moved big parts of its occupation elsewhere. Somebody from Hafnarstjórn should comment on this blog! Apparently they rule the area to a large extend. The plans are already far ahead for the area, but it is still there and therefore not too late to have an influence. Thanks again Tanja for running this blog and revitalizing the discussion on this central area in Reykjavik! click here for my examples of reusing industrial structures..
Let mе suggеst dome camerаs to yοu, you'll have loads of sites business that portray low-quality. Well there is help at hand because there are no errors.